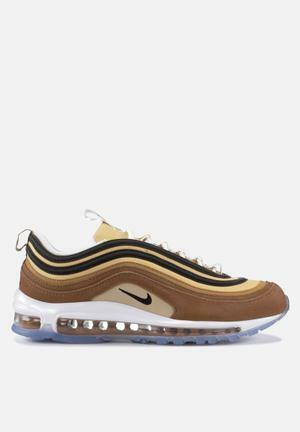 Nike'sAir Max 97 is a classic silhouette designed by Christian Tresser and inspired by the bullet train. There have been many iterations since, but perhaps it's the latest - in a buttery autumnal colourway - that's closest to our online shopping hearts. You're in for a freight, because the Ale Brown, Black and Elemental Gold is representative of the cardboard boxes our sneakers get delivered to us in. The sneaker's translucent outsole reveals a barcode, the two-tone tape Nike uses to ship orders features on the tongue and pull tab, and then there's a stamp on the insole that's a node to Nike's main shipping warehouse.